FA: Tad Steele, Linda Jarret. 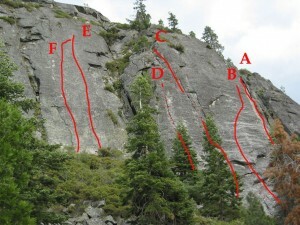 Follow the obvious crack in the center of the buttress. Its best to top out and walk down and around which is kinda a pain, or you can rap off a tree to accessory dogs and then back to the ground with one rope. Which SuperTopo guidebooks include a topo for Just Acquaintances?